The Kharaneh IV 2016 field season has come to a close! We have all traveled home and are resting, recouping, and relaxing after a great field season. It was a wonderful excavation season this year, in no small part thanks to a fabulous crew! Continue to follow our blog throughout the year as we post updates about our ongoing research. Throughout the year we continue analysis of the Kharaneh IV material, and will post about some of the laboratory analysis that takes place after the field season. The first time I laid my eyes on Kharaneh IV my heart fluttered and tears welled in the corners of my eyes- six months I had spent reading about the site and none of the research or photos do it justice. Millions of lithics lay sprawled on the ground glittering in the desert sun nearly untouched for thousands of years just waiting for archaeologists to clean and categorize them. Josh and I walked around site in awe, gingerly picking up artifacts and taking in the environment we would soon be working in. smoothly. At first the lithics sorting was puzzling to me but after a week of working with some amazing lithic analysts the pieces fell into place and sorting the assemblage became easier and dare I say fun! Our time in the lab, although a serious job, never felt too much like work. Giggle attacks, sing-a-longs, and light-hearted sarcasm made lab time fly by and before long our trays were whisked away to be replaced with dinner dishes. Our home in Azraq was comfortable and the community most hospitable. Daily walks to the corner shops and visits from our neighbors were certainly pleasant parts of our days. Perhaps not nearly as pleasant as the amazing food Ismael prepared for us daily. Our downtime was often spent sitting under the olive tree chatting, reading, or drinking tea. I could not imagine a better team to have spent my summer with. At one point we decided to run an experiment on flint blades and the use-wear hair cutting left on them. We got Theresa to knap some lovely blades while Colleen and I discussed the plan of attack. I lost two inches of hair that day and Colleen lost a little skin off her thumb, but all in the name of science! My experience in Azraq is incomparable to any other- the site, team, and artifacts will remain at the top of my personal list of best excavations. I am excited at the prospect of returning next year with even more knowledge and experience under by belt, as I will continue studying with Dr. Maher throughout the year. As a recent graduate of UC Berkeley, and having only participated in field schools, I was very excited for my first excavation at Kharaneh IV with experts in the Epipalaeolithic and lithics. Fortunately, the people, site, and experiences have all exceeded my expectations and have taught me an incredible amount. Firstly, with all the turmoil currently encompassing the Near East, I was very relieved to find Azraq as welcoming and safe as it is. 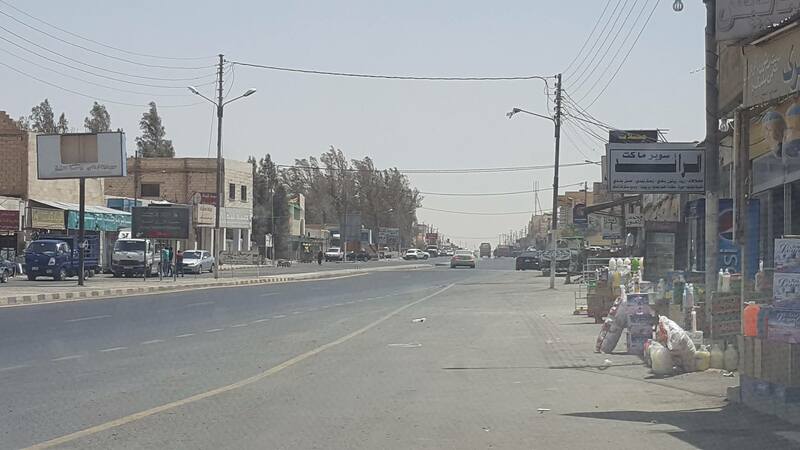 My first day here, I was walking around ‘downtown’ and a shop owner invited me in for some tea, and we spent the next 20 minutes talking about how Azraq has changed over the past few decades, as well as the (seemingly) peaceful family politics that everyone lives with. This hospitality has been a constant throughout my time in this small Oasis city, and has made me feel very safe in walking the streets. As a lithic specialist who was trained under Dr. Maher, I was struck with amazement at the density and abundance of flint that makes up Kharaneh IV. Pictures do not do it justice. 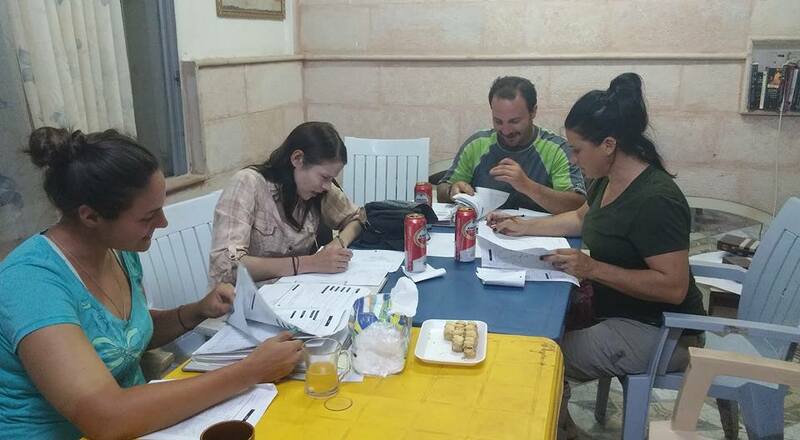 However, the insane amount of artifacts and complex stratigraphy equate to one thing—a lot of paperwork. Out of all the excavations I have been involved with, Kharaneh IV by far has the most amount of record keeping. Although it sometimes seems like a pain, I really do understand and appreciate the steps that are taken to ensure accuracy and reliable records. Also, you know you have a productive day when you have to come home and spend an hour or so catching up on paperwork. A lot of time is spent either doing paperwork, sorting >4mm heavy residue samples, or doing lithic analysis, all of which would seem a lot more boring if it wasn’t for the amazing crew I am working with. Although I am the youngest, I have been given the title of “honorary old person” and feel as if the entire crew gets along incredibly well. It may be because of the delicious food that Ismael makes, but our living room table is always surrounded by smiles and laughing faces (and quite often laughing attacks initiated by Colleen). Everyone takes their jobs seriously and acts very professionally when they need to, but they never hold back a smirk or an opportunity to be sarcastic… And that makes this excavation the best I have ever been on. Finally, since the entire crew is made up of lithic specialists, we have the opportunity to run some lithic experiments. 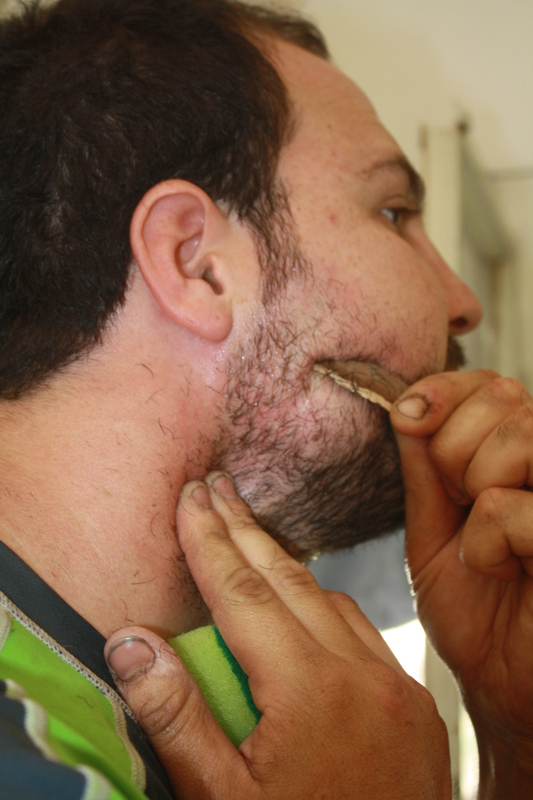 One of which, where I volunteered to be the test subject, was to see how well blades made from flint and obsidian can shave my beard. We did find some interesting results, but for me, I hope this was the last time I shaved with 4 people starring intensely at my face and taking close up photographs. All in all, this is a fantastic field season with great people and a very organized field director. I am honored to be a part of this expedition into the prehistoric Levant, and hope to return to Kharaneh IV in the future. The third week has come and gone! Time has been flying by this year and now we only have one more week of excavations before the end of the project. This week we were joined by two new crew members, Theresa Barket and Bethany Theiling. Theresa is a long time project member and flintknapper extraordinaire. Bethany is a geoscientist and isotope specialist from the University of Tulsa. She is joining the project for the first time and will be conducting some isotopic work on shell beads recovered from the site. Although our daily schedules are busy with excavation and lab work, we took some time after site one day to explore Qasr Azraq, located right in the heart of Azraq and only a short walk from our house. This Qasr was originally a late Roman fort but was reused in later periods for fortifications or a place to live. Lawrence of Arabia even stayed there during the Arab Revolt! Back on site, excavations of Structure 2 are moving along well. We have identified the western boundary of the structure and are slowly working to remove the capping deposits while carefully recording the material recovered from these deposits. For our excavation strategy we usually dig in 1 x 1 meter square units and follow the natural stratigraphy of the sediments. However, now that we are just above the surface of the hut structure we have subdivided the units into 25 x 25 cm squares. This gives us the opportunity to maintain excellent horizontal control so we can analyze the spatial distribution of artifacts. The work is slow going (we are now excavating primarily with leaf trowels and spoons) but we are recovering some really exciting archaeological material. The last week is always busy, with continuing excavations, inventorying our finds, and backfilling the site. We are gearing ourselves up for the last week and will post more stories from our finds this season! As Adam so eloquently wrote in his blog post from last year’s field season (see post here), work during an archaeological project does not end when we leave site and put away our trowels for the day. 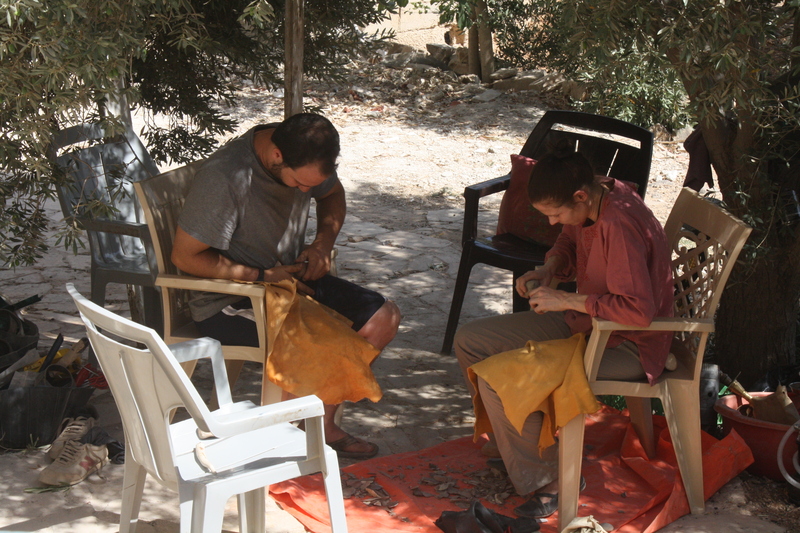 After lunch and a rest, we are back to work in the evenings sorting and analyzing artifacts from the site. This year we are fortunately to have a team composed of students interested in lithic analysis, so the focus of our analysis this year has been on stone tools collected from the site. To begin our analysis, we must first float sediment brought back from site to recover the artifacts, then sort through the 4mm heavy fraction to separate the faunal bones, lithics, and other cultural material from any remaining sediment. Finally, we sort the lithics according to our technological typology. After the field season, a sample of lithic material is shipped to UC Berkeley or the University of Tulsa for specialized analysis such as use-wear or more detailed attribute analysis. The faunal material is sent to specialists, Louise and Adam, for further analysis to identify the range of animals that where hunted at the site. This year we have several goals for the lithic analysis. Back in 2010 we excavated a deep trench in Area A (the Middle Epipalaeolithic area) to get a better understanding site occupation over time. In particular, we are interested in how the lithic technology and retouched tools changed over 1,000 years of occupation. 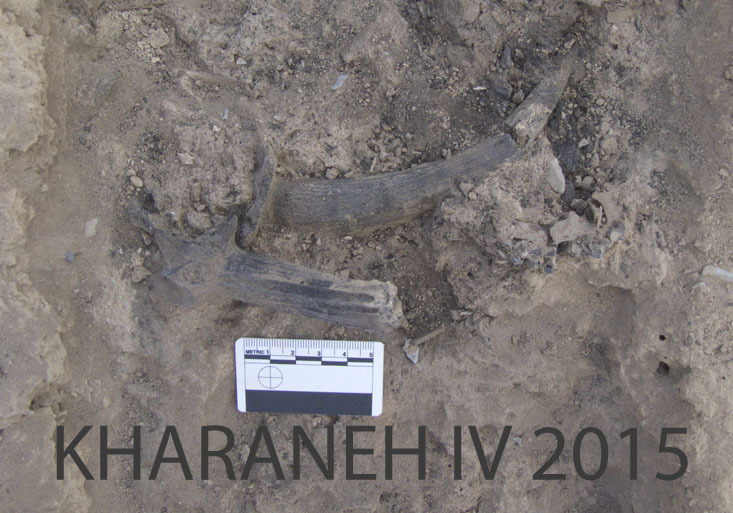 Through looking at these changes we can understand how the site connects with other contemporary sites in the region, how technology changed over time, and which different groups were living at Kharaneh IV. This year we are finishing up the analysis of the deep trench lithic material so we can trace these changes through time. We are also processing material excavated during our current 2016 field season, specifically the artifacts from Structure 2. The artifacts recovered from the second hut structure will provide insight into how people organized their inside space vs their outside space. Through comparison with Structure 1 we can identify whether there are similarities or differences in how material was organized across space in these structures and how this relates to community structure during the Early Epipalaeolithic. The large amount of lithics at Kharaneh IV certainly keeps us busy in the evenings as we try to better understand the site’s Epipalaeolithic inhabitants. year with a mix of new and old crew members to continue our exploration of the Early Epipalaeolithic occupation at Kharaneh IV. Our first week was short, only three days on site, but we were very productive. We unbacked filled our old excavation area in Area B and started two new excavation units. This area has occupations dating to the Early Epipalaeolithic period (approximately 19,000 years old). This field season we are exposing and excavating Structure 2, originally identified in 2010, to better understand the behaviours of the Early Epipalaeolithic inhabitants at the site. Last field season we opened excavation units to find and map the boundaries of Structure 2, however we were unable to locate the west edge. This field season we are opening units to the west to find the extent of the deposits. We have been diligently working in two 1×1 meter excavation units to bring these down to the level of Structure 2. In one of the units we encountered a hearth feature, which contained burnt material such as gazelle horn cores and lithics. This hearth extends further to the north, however these deposits remain unexcavated (perhaps for a future field season!). We are now almost at the level of Structure 2 and I hope to have the full structure exposed by early this week. 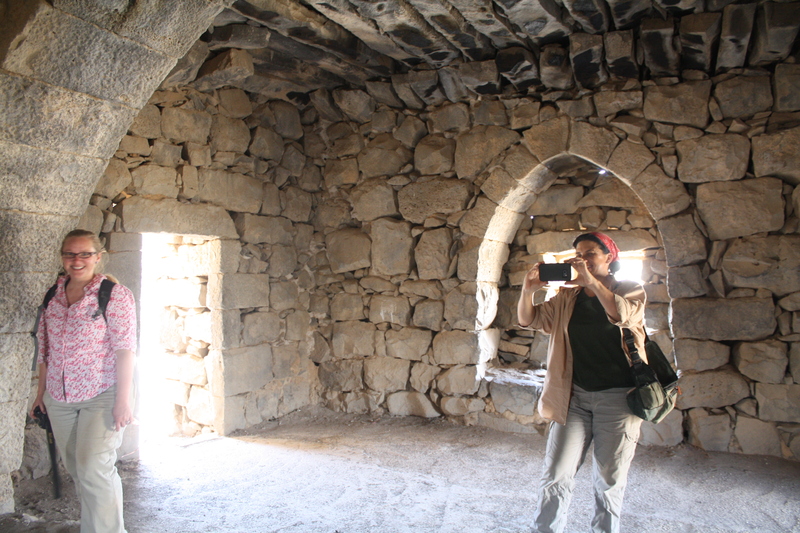 Outside of work hours we visited some of the desert castles including Qasr Kharaneh and Qasr Amra. Both these buildings were built in the Umayyad period. Qasr Kharaneh functioned as a caravanserai (roadside inn) and Qasr Amra as a royal retreat and bath. On Friday (our day off) we visited the Azraq wetland reserve, the last remaining part of the Azraq oasis. Most of our current crew is new to Jordan, so we have had fun exploring some of Jordan’s cultural heritage together. More updates to follow and I will post more frequently in the upcoming weeks! 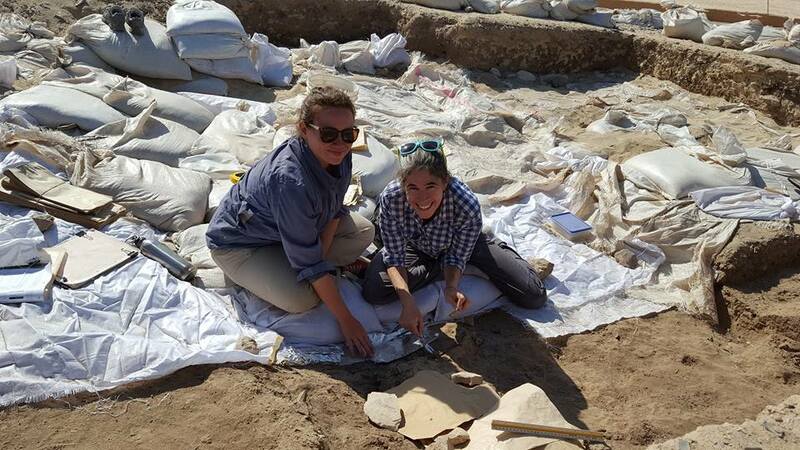 The year flew by quickly and it is now time to start our 2016 excavations at Kharaneh IV. This year Lisa and myself arrived in Amman a week before excavations to attend the International Conference on the History and Archaeology of Jordan (ICHAJ). The conference has been fascinating and we have enjoyed hearing about new projects and catching up with old friends. On Saturday we head out to Azraq to begin our excavations on May 31. 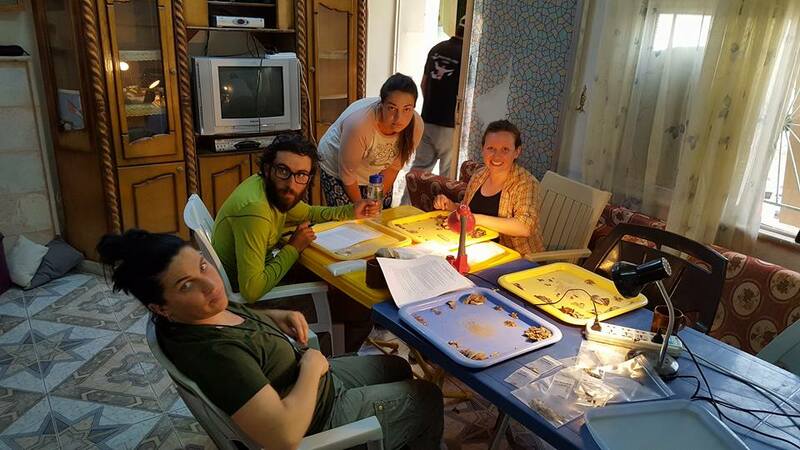 This year we are joined by students from UC Berkeley, University of Tulsa, and Jordanian archaeologists. 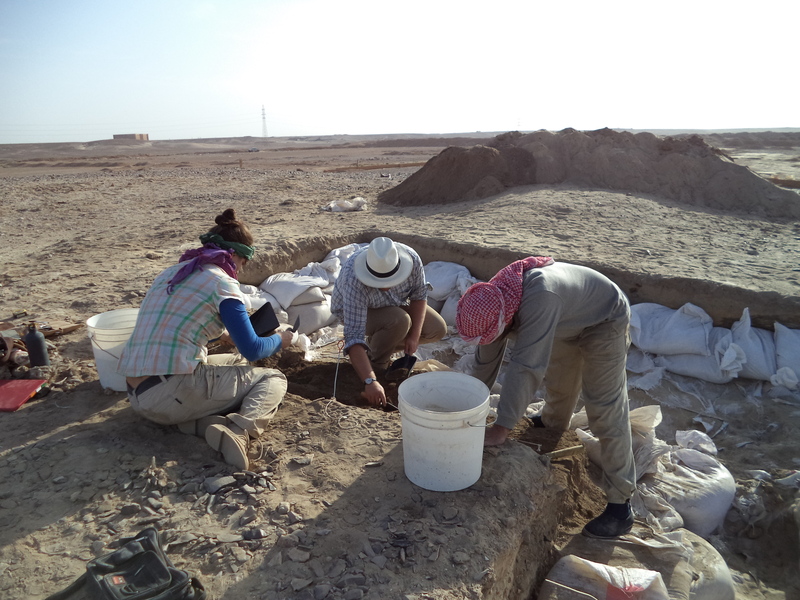 We will return to work in Area B, excavating the second hut structure at Kharaneh IV. In 2015 we began to uncover the structure, and this year will be working on carefully excavating the structure to understand the organization of space within the hut. 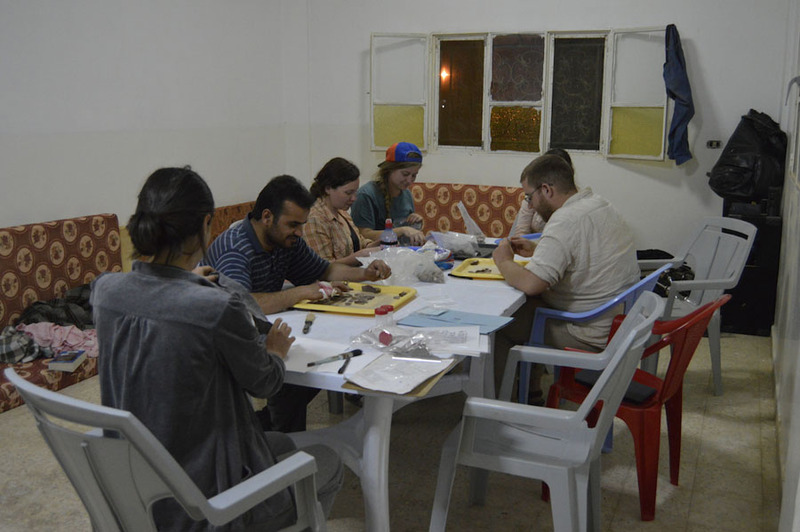 We will continue to post updates on our excavation and adventures in Jordan on our blog. We were thrilled this year to welcome members of the Fragmented Heritage Project (Website) to Kharaneh IV. 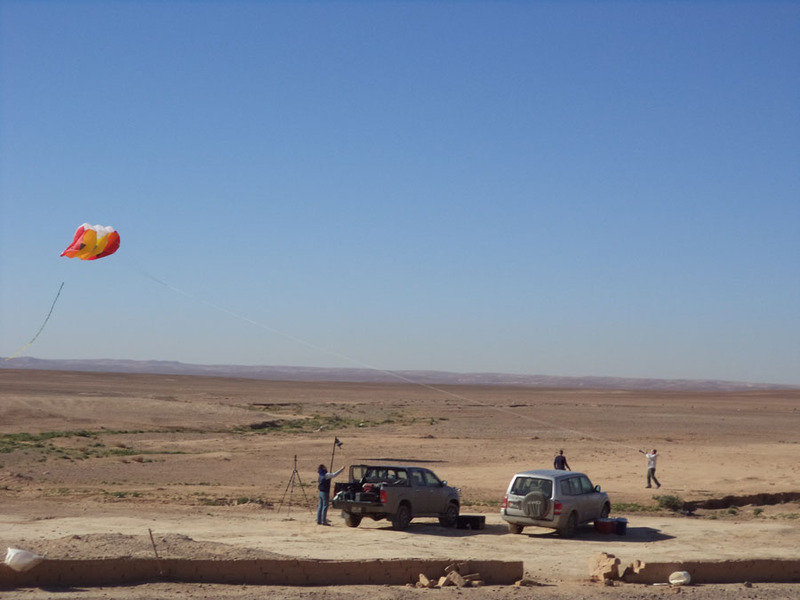 Adrian and Tom joined us to conduct an aerial and terrestrial survey of the site and surrounding wadis through multiple technologies. 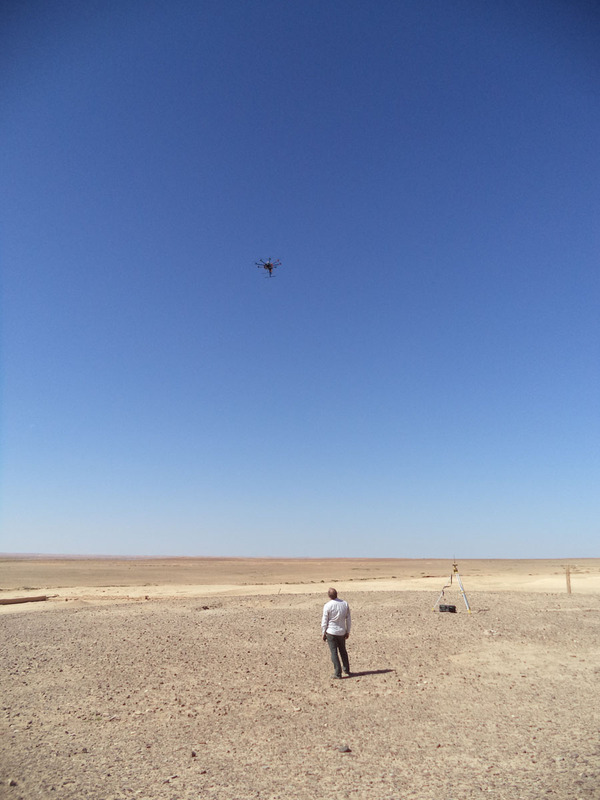 They used an octocopter to capture high-resolution images of the site’s surface, a kite to capture images at higher altitudes, and a laser scanner to create a three-dimensional model of Kharaneh IV. We hope that through these images we can gain a better understanding of the distribution of surface artifacts (of which there are millions!) and identify whether the site surface is changing over time. As well, through the kite photography we are able to monitor changes to the courses of nearby wadis (river valleys). This is important to understand whether the rivers are coming closer to the site to protect against potential damage in the future. We look forward to having them return next year to continue their work at the site. We allocated one of the Kharaneh IV crew members, Olivia, to help Adrian and Tom survey the site. She had the opportunity to use the octocopter, learn how to set up the laser scanner, and now is using a camera on a pole to finish capturing the site with high resolution images. 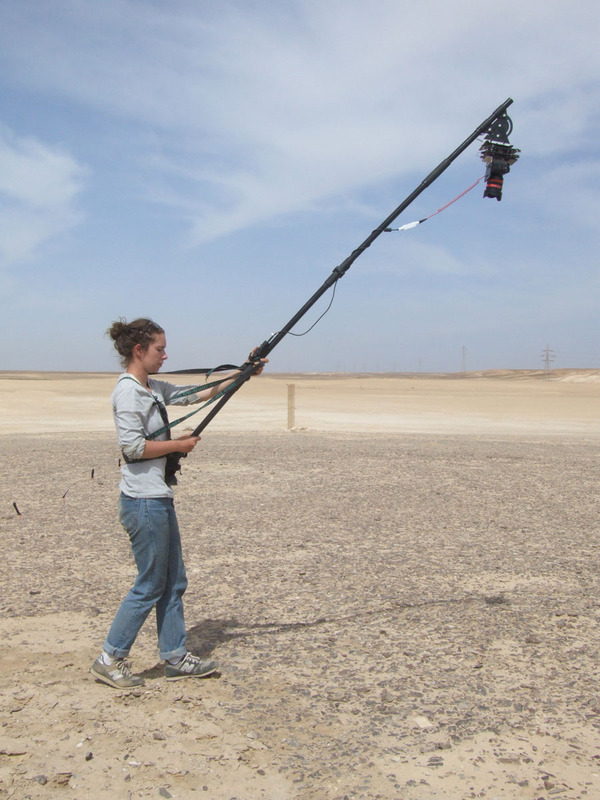 Olivia has written up some of her experiences of working with aerial survey equipment at Kharaneh IV. Flying a kite at work. Olivia’s high tech camera set up. We are now nearing the end of our field season, with only one week to go! The time has been passing incredibly quickly, with everyone busy working in the lab or in the field each day. On site we are still chasing the edges of Structure 2, sometimes thwarted by rodent burrows. I hope that by early next week we will have a better sense of where the boundaries of the structure are so that we have time to map the surface. Some interesting artifacts are already beginning to appear; we have several horn cores (perhaps gazelle?) lying within the deposit, included some articulated burnt horn cores. We also continued to work on the high resolution photography of the site, using the camera pole to capture the artifacts on the surface. Next week we will finish this photography so that the entire surface of the site has been photographed. This Friday, our day off, we decided to stay in Azraq to relax. 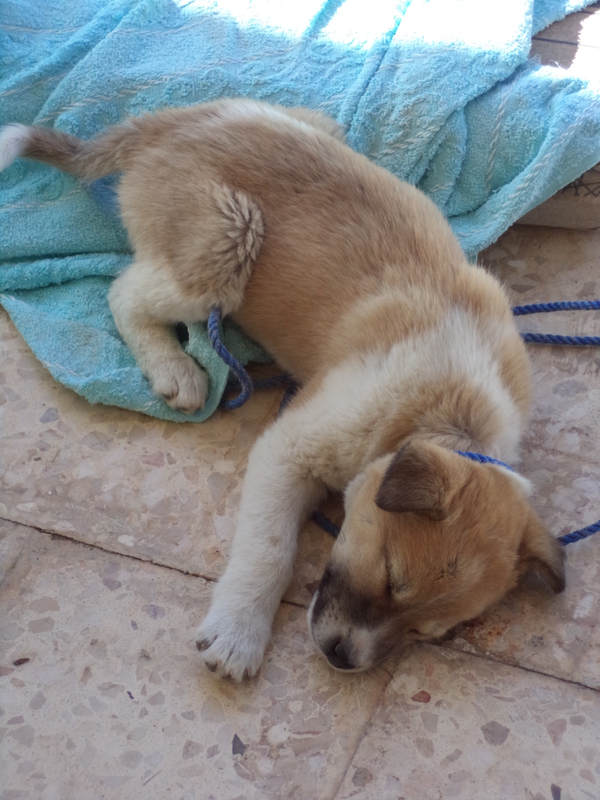 Some of us have gone to Jerash for the day, others are working, and some are just relaxing in the sun with the puppy. Hopefully we will all be recharged for our final week of excavations next week! I spent last week digging a hole with a spoon. Really. This is my first season at Kharaneh IV. Over the last three weeks I’ve been helping out both on site and in the lab. Last week, I was excavating, and the biggest difference between digging here and other sites I’ve worked at — from later periods — is its meticulous pace. 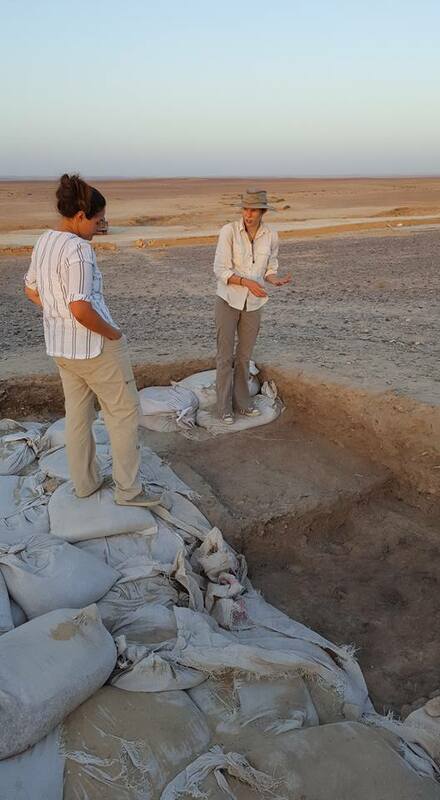 Excavation at Kharaneh IV is like a forensic investigation. But instead of a crime scene, we are trying to work out what happened at a camp site twenty thousand years ago, using the ephemeral traces that have survived in desert sand. In those circumstances, it is important to pay attention to the smallest detail. We peel back — with spoons and brushes — deposits that may only be centimetres thick, each capturing perhaps just a few weeks or months of human life, and compressed under the weight of thousands of years of subsequent activity on top of them. This has been a lot of fun as an excavator: we each dig a 1×1 m unit which is subdivided into 25×25 cm quadrants. Each one is an excavation in miniature, where we’re tasked with unpicking stratigraphic puzzles that at times, given the fragile and complex nature of the deposits, can be quite challenging. This attention to detail ‘at the trowel’s edge’ (or spoon’s edge) is matched by a painstaking recording system. About half of our time on site is spent documenting the deposits we excavate in minute detail: their location, extent, and depth; how they relate to other parts of the site; the nature of the soil; and the precise coordinates of any artefacts on its surface. And as Adam wrote last week, this is matched by yet more time spent processing and analysing material back at the lab. All this information is recorded so that when the time comes, the big picture of activity at the site, and its important place in world prehistory, can be pieced together from the detail. The popular perception that archaeology begins and ends in the trenches is untrue. During fieldwork, excavators meticulously remove sediments, fill-out record sheets, measure and photograph features, collect artifacts, draw section plans, and perform other such painstaking work. Most importantly, excavation is discovery. But this is just the beginning of a process of discovery. 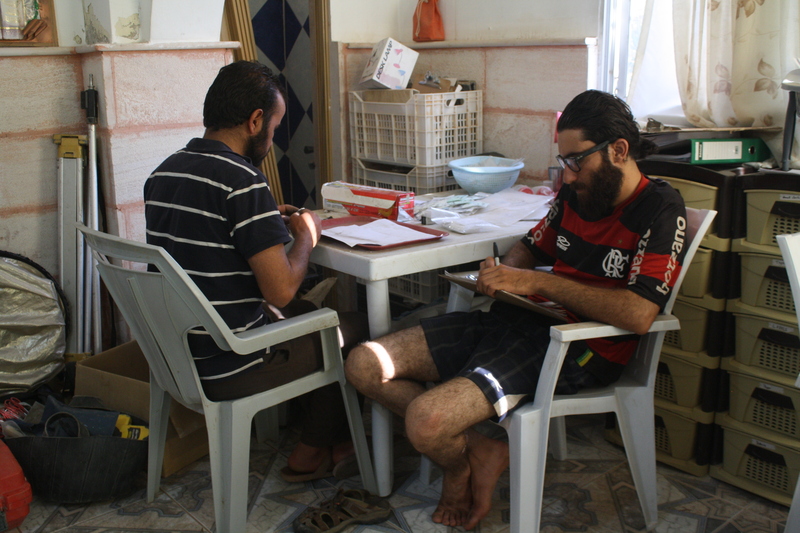 At the end of every day of excavation at Kharaneh IV the lithics, animal bones, bulk sediment samples and records are brought back to the laboratory at our house in Azraq where cataloguing and processing occur. The time required to process, record and analyse archaeological finds is far greater than the time it takes to excavate them. For this reason, it’s import to highlight our efforts in the laboratory. The work in the laboratory essentially picks up where the excavators stop. At Kharaneh IV we collect one hundred per cent of the undisturbed deposits in order recover even the smallest burnt seeds and the tiniest chipped stone debitage. This process, called flotation, involes a barrel tank and gentle flow of water that separates the sediments from the archaeological materials within. Dobrina, our flotation technician, expertly guides charcoal and other delicate botanicals that float through a spout on the rim of the tank into a fine mesh bag below. A coarser flat mesh within the tank catches the materials that sink. The sediments pass through the mesh and settle to the bottom of the tank. The end result is two samples – the flot that contains botanicals and the heavy fraction that contains lithics, bones, shell, and a few unwanted pebbles. Since Jordan is frequently in a state of water shortage, we recycle the overflowing water with a second tank and a pump. Once the various flotation samples are dried, Dobrina carefully transfers the botanicals into small vials and other lab staff separate lithics and bone. A further step is to divide the lithics into broad types, such as blades, flakes and debitage. Danielle will soon conduct detailed analyses of these lithic samples. and Animal bones are also sorted into broad categories such as diagnostics, tortoise shell, and long bone shafts. Trine, who is learning animal bone analysis, is showing a great aptitude for zooarchaeology. In addition to managing the lab, my work is primarily focused on analysing faunal remains from Structure 1, which was excavated in 2010 and 2013, and floated and sorted this year. After Trine does the initial sorting of animal bones, I further refine categories and record the data in a spreadsheet. I record various types of data such as the anatomical element, animal taxon, body side, bone fusion, and butchery marks. I also record measurements of long bone fragment length and I take biometrical measurements, which will later be used to determine the ratios of male to female animals for the most abundant species. Gazelles are by far the most abundant taxon in most contexts. They’re distantly followed by a small wild equids (likely onager), hare, fox and tortoise. Less common animals from Kharaneh IV include aurochs, wolf or dog (notoriously difficult to tell apart), a small wild cat, ostrich, and various small birds. The faunal data generated from my work will help inform the environmental reconstruction and more immediately, inform our understanding of how Early Epipalaeolithic hunter-gatherers prepared food and organized their internal living spaces. At Kharaneh IV, archaeological research is a multi-stage process managed through coordinated efforts among generalists and specialists. Our collaborative, multi-disciplinary endeavour requires cooperation among fieldworkers at the site and staff at the laboratory. As such, our discoveries are made as a team and at every step of the way.